Description: Fiends are some of the quietest assassins because their voices should not be heard by normal hearing senses. Even if their victims do survive, they will not hear a sound for the rest of their lives. Previously called "Jagged Fiend Cowl". Jagged Fiend Hood of Nulgath. Jagged Fiend Sneer of Nulgath (AC). Jagged Fiend Sneer of Nulgath (Legend). Rogue Fiend Hitai-ate of Nulgath. 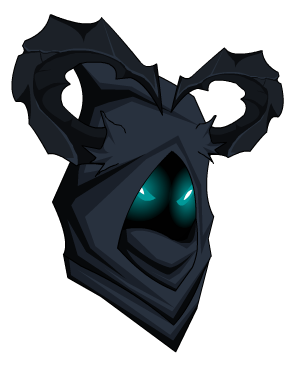 Rogue Fiend Hood of Nulgath.